Technically, I don’t think there is an official definition for tall stitches in crochet. However, it does imply above average crochet stitch lengths. For some they may be those without definable names. For others they may be stitches taller than double or treble crochet. The main point is, they do have names and it’s not terribly complicated to figure them out. And what’s more, there is only one basic method for making all of them. Basically the number of yarn overs you make will predict the length of your stitch. You yarn over once for a double crochet and twice for a treble (or triple) crochet. Yarn over three times for a double treble crochet and four times for a triple treble crochet. 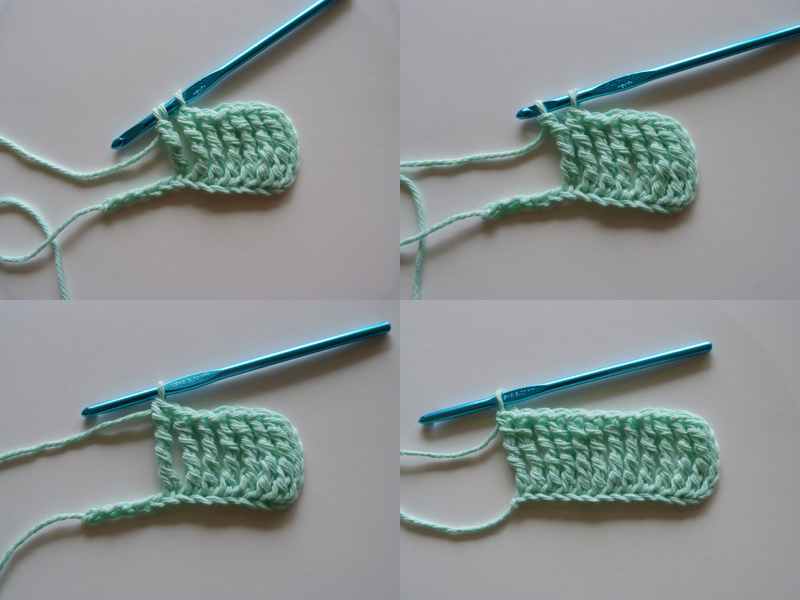 As you do with double crochet and treble crochet, simply yarn over and work through two loop intervals until you no longer have any loops on the hook. Do you see the pattern? No matter how tall you choose to make a stitch, this basic method of yarning over so many times to start and working off two loops at a time is all you need to know. 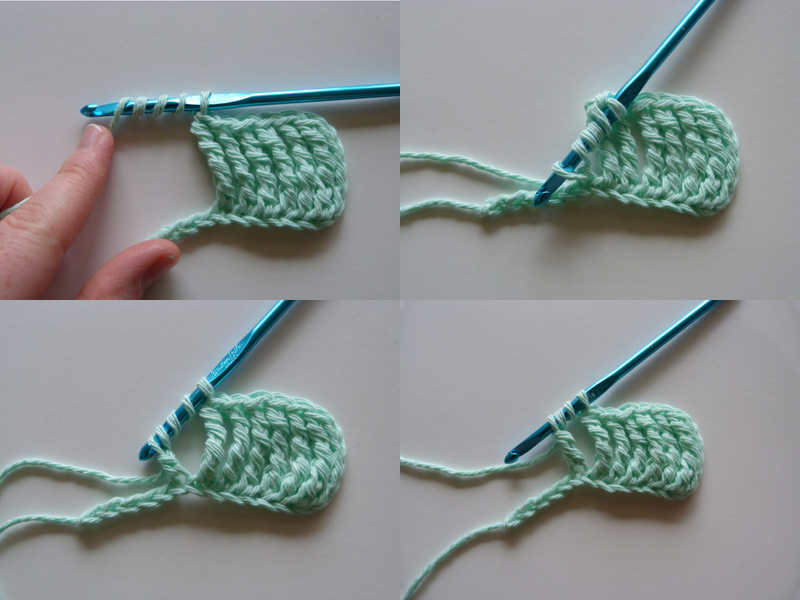 Here are a couple of collages of the triple treble crochet stitch to show you what I mean. Follow this same pattern for each and every tall stitch. But what do you call them once you’ve made them? Let’s assume for this post that tall stitches are those after double crochet. Here is a list of their names and how many yarn overs they require. You may or may not be acquainted with the first few. There is one thing to take note of: the taller the stitch the harder it is to keep it looking neat. For example, in the first picture above the darkest blue swatch which consists of septuple treble crochets became hard to handle and unruly very easily. If you work them too loose then by the time you are making that last yarn over and pull through you will have a very saggy stitch. My best recommendation is to work the loops close together and not let a lot of space between them. Tip: I hold my hook with a pencil hold but I have found that using a knife hold for taller stitches better gaurantees a neater stitch. You can refer to the list above or figure it out for yourself with this handy formula. Notice the name of the stitch in direct relation to the number of yarn overs. A great reminder for recalling the number of yarn overs per stitch is by simply adding one to the name of the stitch. 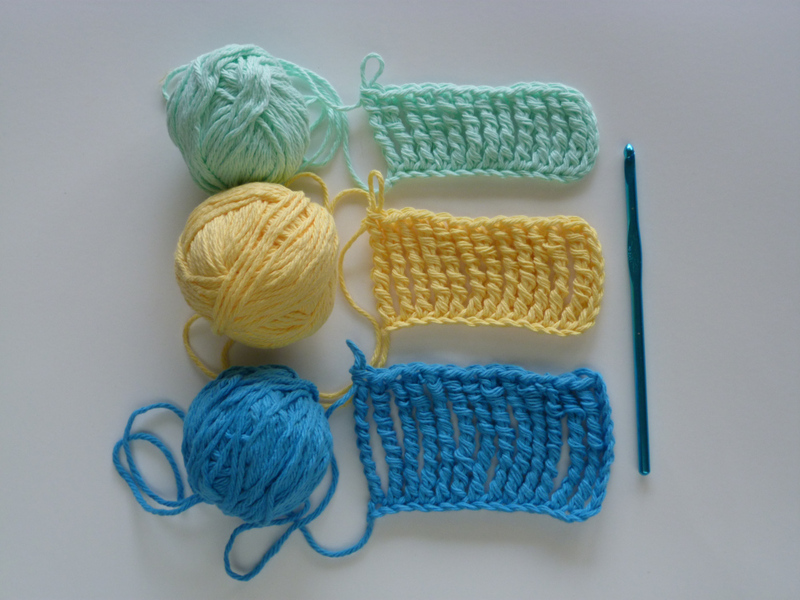 For example, if you have chosen a triple treble crochet stitch you can add one so that triple would be quadruple, or translated to 4, meaning yarn over 4 times. This works in reverse as well. If you have crocheted a stitch with 8 yarn overs and are trying to figure out what it’s called, simply subtract one from the yarn overs and figure out its latin name (in this case, Septuple). With this method you can figure out both the name and the number of yarn overs for stitches as long as you can make. Although I tend to need a lesson in latin numbers before advancing beyond decuple (10). These stitches are not very well known today because most modern crochet patterns do not use them. This begs the question, when are they used then? Perhaps the most I have seen these taller stitches used would be in patterns with crochet thread. Such as Irish Crochet Lace, crocheted Antebellum Dolls, and crocheted Doilies. Of course, there are other ways to use these unique stitches, such as lacy crochet stitch patterns for breezy sweaters, delicate wraps, scarves, and you name it. Truly there is no end to what you can make with tall stitches. Be inventive and give it a go! One thing I’ve noticed, no matter how much you know about crochet, there is still more to learn. Have you enjoyed this post? Be sure to share your thoughts in the comments below! This entry was posted on Monday, April 15th, 2019 at 8:34 AM by Amy	and is filed under Tutorials and Help. You can follow any responses to this entry through the RSS 2.0 feed. You can skip to the end and leave a response. Pinging is currently not allowed. How clever, Christine! Thanks for sharing! What a wonderful idea, Daisy! I’d love to see what you come up with. I collect “Barbies” I would love the to make the dress above. Where can I get the pattern? I also make at lest 2 scrubbies before going to sleep, and Tall Stitch’s would be nice to use. Pattern ideas anyone ? Happy Every Day We can still crochet ! The pattern is impressive, isn’t it? 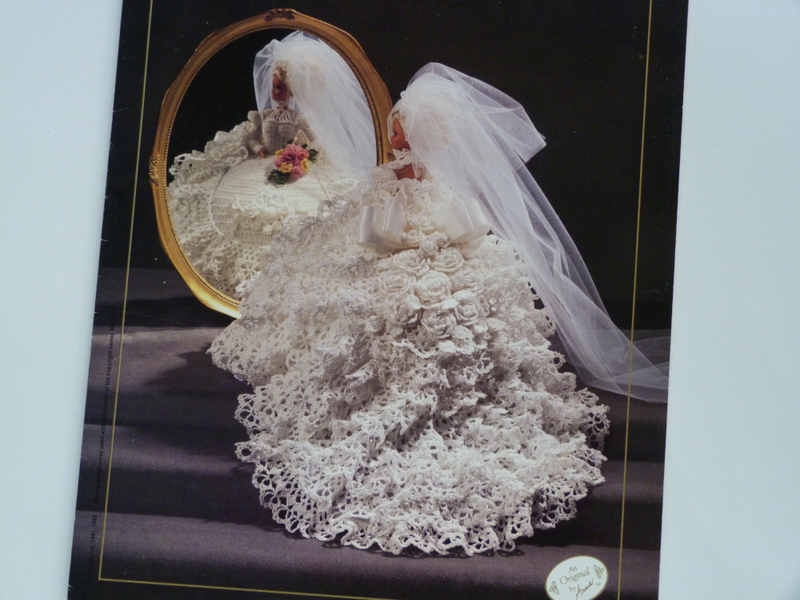 It’s an old one from Annie’s Attic (now Annie’s Catalog) called Annie’s Bridedoll Gown. As far as I can see you can’t buy them now from Annie’s but if you did an internet search you could possibly find a copy someone else is selling. I saw one specifically on Ebay for $3.97. Using tall stitches for your scrubbies sounds like a great idea. And I love your commitment to crochet every night! Perhaps soon I’ll have some patterns that make use of tall stitches. Thank you for sharing. I had not thought about it but that would be a great solution for spriggly stitches. I will look into it further!